Home » Food n Beverage » iphone » MAMEE » purchase » qna » smartphone » spend » WhatsApp » Peraduan MAMEE "MAKAN SAMPAI MENANG" Contest: Eat till you win a latest iPhone! 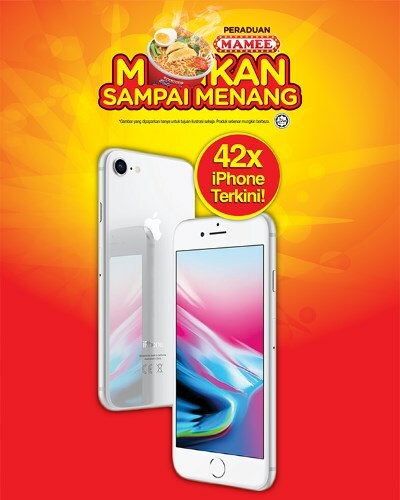 Peraduan MAMEE "MAKAN SAMPAI MENANG" Contest: Eat till you win a latest iPhone! Answer 1 Contest Question written inside the MAMEE "MAKAN SAMPAI MENANG" cup label and open the label to get your unique code for the Contest. Send your answer, unique code, MyKad number and full name to +6016 372 6297 via WhatsApp. Visit Peraduan MAMEE "MAKAN SAMPAI MENANG" Contest terms & conditions for more details.